When is the first fire up? Looks like you are moving right along. Not sure yet. Depends on whether I go fuel injected or just use the 45DCOE I have. The Weber would be a lot faster, wiring wise, but then I have to use my points style 12A distributor and figure out the wiring for that. I like the way the fuel injection works though and keeping everything stock FC eliminates a lot of tuning hassles down the road. Working on transmission mount now. I stole the poly T-5 trans mount I had for a 5.0 Mustang and am adapting that. It is actually fitting fairly close and is only requiring minor modifications to fit. The T-5 mount is quite tall for most uses, but should work fine in this application, I think. I cut out the original fixed transmission crossmember as it makes getting the engine in and out a royal pain. The problem with cutting it out is that there is nothing to bolt a replacement to. 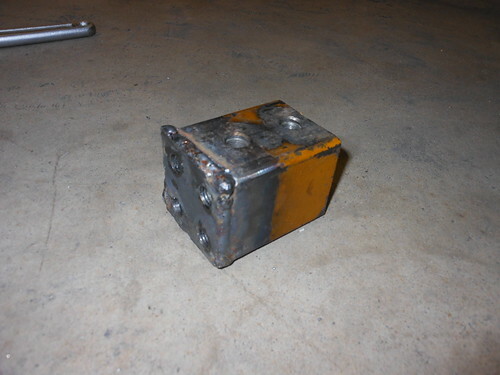 The crossmember is only boxed light sheet metal and is insufficient for bolting a heavier gauge center section to. My solution was to use 2 3/8ths outside square tubing, which slid into the stubs nice and snug. Finding that size tubing is a bit of a bother, but it works perfectly. 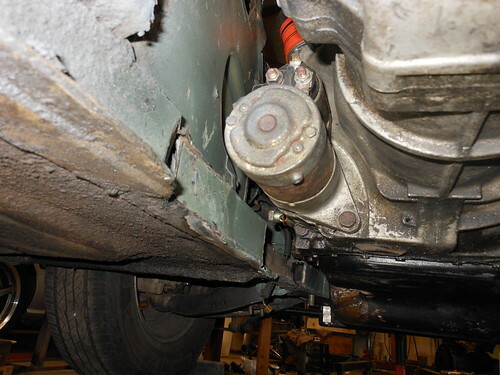 I then used 1/2" bolts to fasten it within the frame rails. Capped off the ends with some 3/8ths plate and welded nuts inside for both the facing plate and the frame fasteners. There will be a 2" wide (1/4" plate) strip bolted underneath, as part of the center section, with the rest of the center section bolted both below and to the sides. I planned it like this so that I wouldn't be hanging the mount from something that the bolts were in shear. more pics when I get that done. 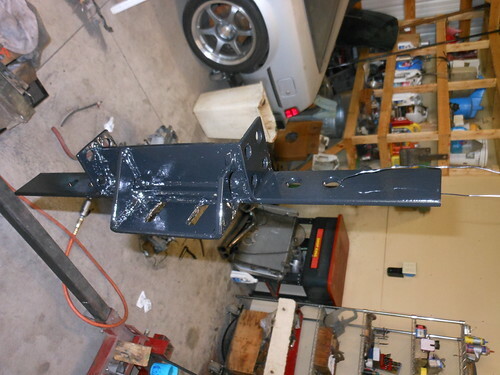 I have to wait for the paint to dry then I can re-install it and post a picture of it installed, with the transmission sitting on it, tomorrow. as always, i'm quite impressed with your work. i think if you already have the Weber setup in hand, then you should use it. you could always take the EFI road later on. besides, it would give you a jump on ironing out some wrinkles before the EFI wiring headaches. I have the carburetor, but not the manifold. 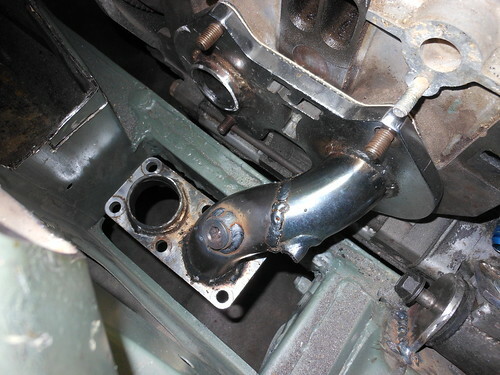 The carburetor would also need extensive re-jetting as it currently has 36mm chokes which would have to be changed out for 40s, along with the emulsion tubes, idle and main jets, etc. I keep waffling back and forth on it. 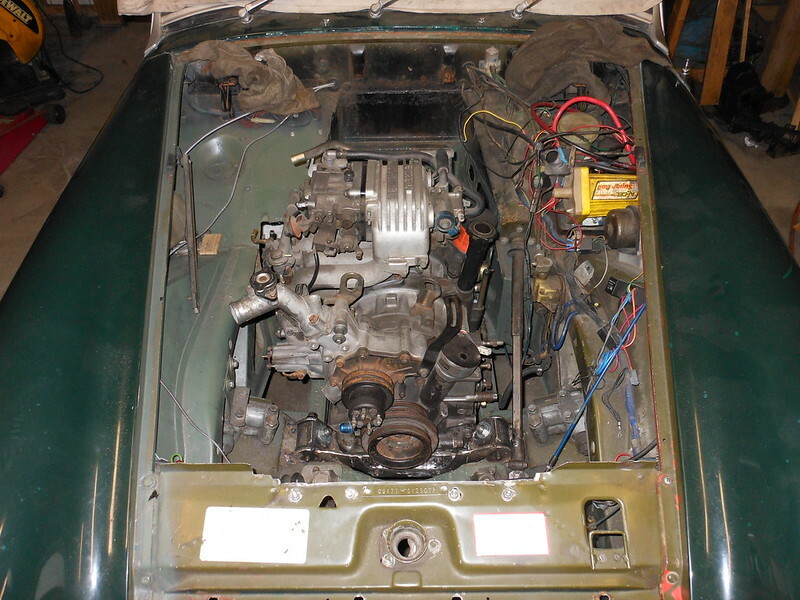 I will have to see when I try to re-fit my hood (bonnet for Brian) with the engine in there. If it doesn't fit with the EFI upper, which is what I've been told, then I'll definitely be using the Weber. This car has made me want to join you in that bottle of Glenfiddich on a great many occasions. Last edited by GySgtFrank; 06-05-2015 at 07:01 PM..
ahhh ... understood. it's not complete. although, it also sounds like the writing is on the wall, so to speak. As promised. 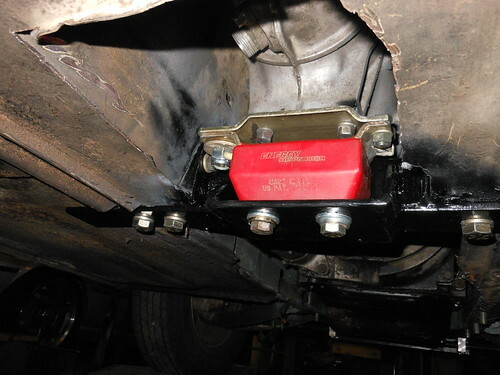 Pictures of the finished transmission crossmember installed. I couldn't get the bottom rear side bolts in, there just isn't enough room to get a wrench in the limited space to tighten them. It should be fine with three 7/16ths bolts per side though. Quite often things don't quite work out the way I intended. While under the car I took a shot of the frame modification I did for the starter. The starter had me worried, but it fit fine. The only problem was having enough room to get it out without having to pull the engine to do it. I considered that to be what you would call a "bad" thing. 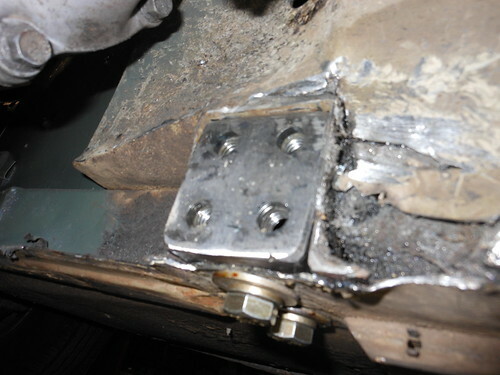 So I laid the frame rail back a bit and plan to bend and weld in a piece of 1/8th inch plate to reinforce that spot while leaving me enough room to service the starter when it needs it. The hood closes with the EFI manifold on the engine. I have about 1/2" of clearance at the closest point from the top front edge of the manifold to the underside of the hood. Even the filler neck for the coolant fits with plenty of clearance. This is rather astonishing to me. I figured and measured and planned it out to get the engine low enough for it to go in there. I'm actually about two inches lower than I have seen anyone else set the engine in one of these. That two inches was a LOT of work to get though. When you're juggling as many variables as there are in locating an engine in a space this small I've come to expect things not to quite work out right. I's a happy camper right now. I did have to trim a little more than I expected from the passenger foot well though. I don't think that it will be a problem with where it's at, but if anyone complains I'll just punch it and they'll be so busy hanging on they will forget all about it. Last edited by GySgtFrank; 06-06-2015 at 11:33 PM.. Thanks. Oh yes it is! Getting that S4 EFI manifold to fit under the hood was one of my biggest hurdles when planning out this swap. It is a plus having an engine that fits under the bonnet..
Nice work Gunny! I'd give you grief and tell you to slap a turbo on it, but after seeing how little room you have to work with in that last picture, I'll just keep my yap shut! It is just a skosh tight in there. So this is what I spent an entire day doing. Just one little piece of tube, that's all. Right! well besides the tube, I did get the O2 sensor bung welded in, so that's two things I guess. I am modifying the Racing Beat 6 port header, that I already had, to fit in the midget. It will have to be a two piece design if I am to have any hope of ever getting it in and out of the car. 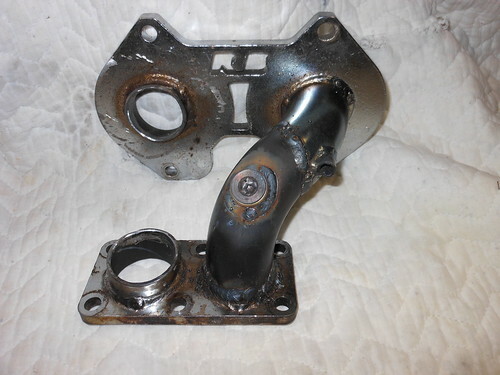 This is the upper portion mating to a road race outlet flange. It will be mated to a lower section using the same type of flange and making an immediate 90 straight back. Needless to say there was lots of fiddling to get it just right so that everything would go where it needs to. Now that I have a better idea of what I will need, I ordered some more flanges, bends, and straight tube from Racing Beat to finish part of the exhaust system.